Fight the War on Christmas! Observe Advent. The signs are everywhere. Houses and yards are adorned with twinkling lights and plastic snowmen. Stores festively display Christmas decorations and the latest must-have items of the season. Our mailboxes are bursting forth with invitations to gift exchanges, tasting parties, and other holiday festivities. At long last that magical season is upon us. But wait! It’s mid-November I still have fall leaves in my yard and a pumpkin on my porch. I haven’t even planned our Thanksgiving meal yet? How did it get to be the Christmas season already? That’s easy. The retailing powers decided long ago that the more shopping days there are in the Christmas (or as it in now known, holiday) season, the more people will shop. The lines that begin forming outside some large chain stores before the pumpkin pie is even off the Thanksgiving table, prove that the retailers are right. Since the holiday season is the time when manufacturers and retailers do their best business, they have a vested interest in dictating exactly how we observe the moment in history when God became man. They want us to prepare for Holiest events in human history by shopping and shopping and shopping and shopping and shopping! However, to truly prepare our hearts and minds for the coming of the Lord, maybe we should consider how people used to do this before they had the benefit of Wal Mart to help them. Actually, we first need to get our minds around the concept of preparing our hearts and minds for the coming of the Lord. There has been a lot of hubbub in recent years about The War on Christmas, but actually the war has been on Advent. Our retailers don’t give two hoots about what we do December 25. They care about all the shopping days before it is actually Christmas. You see, what is now known as the Christmas season (the time somewhere between Halloween and the opening of the last gift) is actually called Advent. Advent begins on the fourth Sunday before Christmas. Traditionally Advent was a time of preparations. Christians prepared themselves for Christ’s coming both as a baby in a manger and for His second coming at the end of time. Parties, gorging on fudge, shopping and Hallmark movies are not actually longstanding Christian customs. On the contrary, to prepare for the coming of Christ, Christians traditionally spent the days before Christmas in somber reflection. Advent is a time to reflect on one’s shortcomings and to cleanse oneself in preparation for Christ’s arrival both spiritually in our hearts at Christmas and literally at the end of time. But I live in the real (and increasing secular) world and I know that it is often unrealistic to cut out all the Christmas fun and goodies until December 25th. There are class parties and office parties, family obligations and family expectations. Still, simply being aware that preparing for Christmas means more than wearing a Keep Christ in Christmas button to the mall is a start. So how can we observe Advent and truly prepare for the coming of the Lord in this hectic, consumer-driven season? Shop early. One simple alternative is to spending Advent at the mall, is to shop before Advent begins. This takes some organization and forethought, but it keeps Advent simple and relatively stress-free. Shop with companies that reflect Christian values. SERRV, a nonprofit organization operated by Catholic Relief Services, offers beautiful handmade, fair trade gifts produced by families who struggle to earn a just wage. This article offers different perspectives on Christian consumerism and some suggestions for shopping too. Shop local. Buying from a small mom and pop store helps support a family directly in a way that shopping the big chain stores does not. Not only that, these experiences are often more relaxing and more pleasant than negotiating a crowded mall. Shopping and chatting with friends and neighbors builds a sense of community that helps keep to get us in the Christmas spirit. Buy an Advent Calendar. A Christian one. This charming tradition helps children focus on get excited about what (or who) is to come by daily drawing their attention back to the meaning of the season. Advent calendars can be even more powerful when paired with prayer. Build a Spiritual Crib. This short daily devotion that is a great way to help kids prepare their hearts for the Baby Jesus. Decorate in keeping with the season. 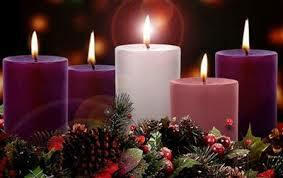 Trim the tree and the mantel with purple ribbon, the liturgical color of Advent. Add red and green on Christmas Eve to signal the change from Advent to Christmas. Buy of make Christian ornaments for you tree like these or or these. Pinterest is full of them. Also consider getting or making a Jesse Tree. Celebrate the Feast of Saint Nicholas. When my children were small, we would put their shoes in front of the hearth on the night of December 5th. The next day they would be filled with candy. Occasionally Saint Nicholas would leave a present like a new nativity set or some Christmas decorations. He always left a note encouraging the kids to keep preparing for the Baby Jesus through prayer and good behavior. Light an Advent wreath. An Advent wreath and the prayers that accompany it are a visual and spiritual reminder that the Light of the World is coming to banish the darkness. Of course the most important thing we can do to prepare for Jesus’s coming is to pray. Advent is a time to do this in a specific and beautiful way. My prayer is that my family and other Christian families will not get so caught up in the Christmas trappings that we fail to remember the One we celebrate on December 25 and every other day of the year.